New to the Stauff Connect product range and introduced for the first time at the Hanover Fair are FI-WDDS-type soft-sealing cutting rings, which compensate for settling effects in tube fittings, for example, from temperature fluctuations or from pressure pulse and vibration loads in a hydraulic system. With 24° tube connectors, 37° flared tube fittings and Stauff Form, the tube forming system, Stauff already offers a varied range for the delicate detachable connection interface in hydraulic tube systems. With the FI-WDDS-type soft-sealing cutting rings, the product range is now being expanded to include another option for the user. This cutting ring design prevents settling effects in which purely metal sealed connections cannot always compensate—with the undesired consequence that small leaks such as the sweating effect may occur at the connection points. A core component of the soft-sealing cutting ring is an elastomeric seal, which is positioned to stay in place in the rear area of the 24° taper in a groove. An O-ring placed between the cutting ring and tube protects the second possible leakage path—even with wide tolerances. As both elastomeric seals are positioned in the secondary area of the connection, the static and dynamic loads in the system are primarily taken up by the proven metallic seal. The use of FKM (Viton) as a standard sealing material make the new sealing system suitable for high temperatures or aggressive media. The cutting rings themselves—like all other components in the Stauff Connect product range—are designed as standard with a high-quality zinc/nickel surface coating. With more than 1,200 hours of resistance to red rust/base metal corrosion in the salt spray chamber, according to DIN EN ISO 9227, this offers reliable corrosion protection far beyond the usual market standard. And it exceeds requirements defined in the VDMA standard sheet 24576 for tube connections with the highest corrosion protection class K5. The soft-sealing cutting rings of the FI-WDDS series can be supplied for all common metric tubes with an external diameter between 6 and 42 mm. They are suitable for nominal pressures of up to 500 bar in the Light Series, or up to 800 bar in the Heavy Series, and exceed the pressure specifications of the ISO, in some cases significantly. 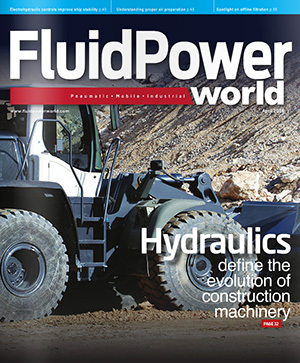 Mobile hydraulics are among the most important areas of application for the FI-WDDS series. However, soft-sealing cutting rings are also a reasonable alternative to metallic sealing connection systems in stationary hydraulics, for example in heavily vibrating machinery.